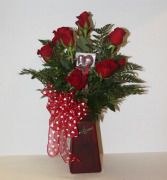 Dozen roses with greens in a colored vase plus an Oliver's Chocolate Heart. 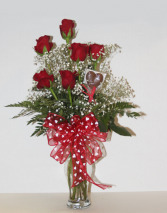 When ordering please tell us the color roses you would like: Red, Pink, White or Lavender. Oliver's Candies are handmade by master candy makers. 1/2 dozen roses in a clear vase, plush puppy,and an Oliver's Chocolate Heart. 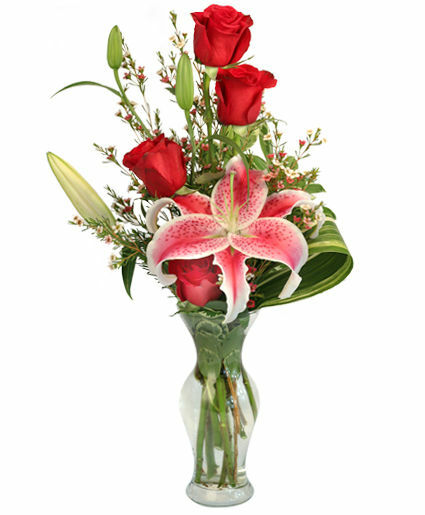 Please tell us what color roses you would like: Red, Pink, White, or Lavender. Oliver's Candies are handmade by master candy makers.